GEOPATHIC STRESS & ELECTROMAGNETIC RADIATION (EMR) has been found to be the common correlating factor in most serious and long-term illnesses and psychological conditions. After many years of research and trials, a very powerful harmoniser has been developed to neutralise and clear the harmful geopathic stress and EMR (electromagnetic radiation) / electro-stress. What is geopathic stress (GS)? Helios3 produces a frequency of 7.83Hz (Schumann waves) which soothes the brain so your brain gets the same benefits as when you sleep in geopathic stress-free zones and with no electro-smog. Helios3 is a high tech device that simulates the Earth’s beneficial frequency (a soothing 7.83Hz field) allowing our bodies to tune in to its rhythm. In this way, we protect ourselves from the negative impact of geopathic stress and electromagnetic radiation. In short, Helios3 counteracts the negative effect of geopathic stress and electromagnetic radiation by balancing the human energy field with the Earth’s resonance for optimal harmony. 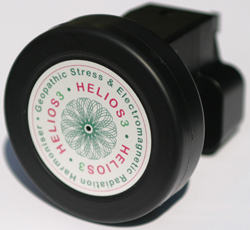 Once plugged in Helios3 will start to rebalance your energy and harmonise the energy of your home or workplace. A 2-pin European and the US models are also available as. 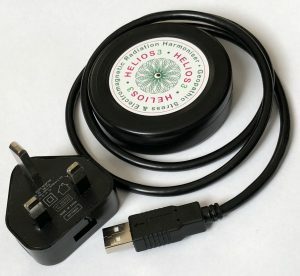 Also, a portable, Helios3 USB Geopathic Stress (GS) and Electromagnetic Radiation (EMR) plug version is available which you can plug in into your computer, car or any USB charging sockets to give you an extra boost of Schumann resonance in your local environment at home or workplace.